I really enjoy being challenged by my customers. It gets me out of my comfort zone, and spices things up. As much as I appreciate the classic look of a coke-bottle-green noserider, you can only do so many solid resin tints before it gets, well, boring. I can always rely upon customer Kirt to stir things up, and his request for this 9-3 Classic Model was no exception. 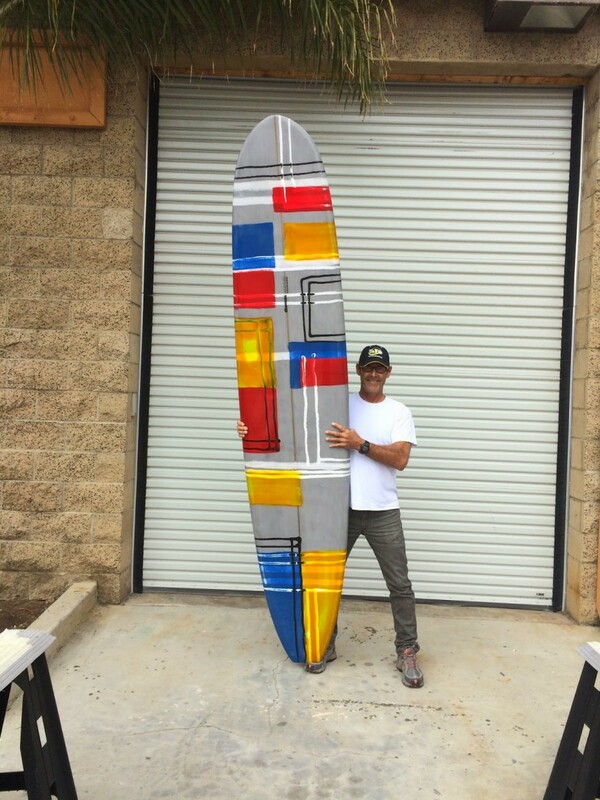 This 9-3 x 23″ x 3-1/8″ round-pin single-fin, has 50/50 rails, half-length nose concave and extraordinary resin work by Ray Lucke. The board was done with a multi-colored, reversed-lap deck and solid blue tint bottom inlay. A double pinline on the bottom neatly cleans things up. To get a glimpse of the complicated process required to produce this very special lamination work go here. Ray and I have been building boards together for over 4yrs and I think this definitely one of the best that we’ve done. We’d love to build your next board. Challenge us!